As I walked down 1st Street in Sanford, FL I was pleasantly surprised by the presence of “EV Parking” spots. These are parking locations reserved for electric vehicles with plug-in chargers. I haven’t seen much EV parking in Florida, so to see them in this small town was a surprise. As someone seriously considering an electric vehicle as my next car purchase, I thought this really showed progress for the city of Sanford. Then, in that same moment of thought I remembered why I was in Sanford on this day: to help rally the collective energy of a nation asking for justice in the killing of a young man on his return home “walking while Black”. I immediately wondered how could a small town showing such progress with green technology turn back the clock during Black history month in 2012 in a situation that feels too close to the Emmitt Till tragedy of 1955? Enough has been written on the events surrounding the fatal shooting of Trayvon Martin on February 26, 2012 that I won’t recite the details in this post. Instead, my focus in this article identifies three areas to return to progress. 1. Justice. 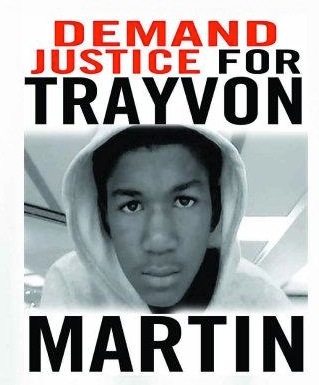 The estimated 30,000 people rallying for justice at Fort Mellon Park in Sanford, FL along with the 1.5 million who have signed a petition on Change.org are asking for one simple request: the arrest of young Trayvon’s shooter, George Zimmerman. As more data from 9-1-1 calls and eye witness accounts have surfaced its clear to millions that Zimmerman should at the least be arrested. It also seems that his self-defense argument has become weak as he’s heard in the 9-1-1 recordings pursuing Mr. Martin. So at this point, we’ve seen much less than justice from the Sanford police department response. 2. Trust. When we coach clients in transforming from conflict to collaboration we include trust as a core competency. In absence of trust, Trayvon Martin saw the stares of a stranger from a truck as a threat and chose to remove himself from potential danger. Is this not what any parent would teach their own child? In the absence of trust, George Zimmerman saw an unknown person, labeled him as suspicious (according to the 9-1-1 call), and pursued him despite a request from law enforcement to not do so. And now the calls for justice echo the mistrust of the Sanford Police in their treatment of Trayvon Martin as the perpetrator instead of the victim. Even as Michael Baisden points to the lack of trust towards Sanford’s City Manager Norton Bonaparte Jr. when, in his interview with Reverend Al Sharpton on Politics Nation, he explains why he didn’t shake the hand of Mr. Bonaparte. Prior to Mr. Baisden going on the air for the interview, I had the opportunity to witness the moment when Mr. Bonaparte extended his hand out to Mr. Baisden. Even I felt the sting expressed in Mr. Bonaparte’s face as a fellow (and prominent) African-American explained why he wasn’t reciprocating the normal gesture of a return hand shake. This moment was another reminder of the conversation I’d just had minutes before with Sanford Mayor Jeffrey Triplett of the need to establish trust throughout the community. Unfortunately, Mr. Bonaparte’s limited showing of empathy over the last few days of media presence had apparently not endured a sense of trust in the eyes of Mr. Baisden. What does trust look like even in the height of emotions around injustice? It’s the embrace of a grieving Sybrina Fulton, the mother of Trayvon Martin by Joyce Hamilton Henry, ACLU Mid-Florida Regional Director. As Sybrina looked into the misting eyes of Joyce she said, “don’t you cry, because you’re going to make me cry”. They may not have known each other, but they understood each other. Similarly, as Tracy Martin, Trayvon’s dad, walked past me with the look of exhaustion in his eyes we connected with a father-to-father embrace and the mutually expressed simple words “thank you”. Again, I had not previously met Tracy, but that moment of understanding lead him to trust the embrace of a stranger’s support. Minutes before these interactions, I was extended the hand of a tall, white gentleman who simply introduced himself as Jeff. I’d known from all the media coverage that “Jeff” was, in fact, the mayor of Sanford. After a few minutes of sharing thoughts on healing the community once justice is served, Mayor Jeff extended another gesture of trust by providing his private contact information to my colleague Tanya Humphries and me. Our interaction was a mutual exchange of humility in listening with a willingness to be influenced by the conversation. There were other elements of trust exhibited that included transparent, empathetic sharing as parents understanding this tragedy and the need for doing what’s right. Never did either of us seem concerned about posturing sides, scoring political points or other elements of suspicion that could have built a wall of counterproductive beliefs. These few observed moments of trust compared to the examples of mistrust show the more important difference in outcomes. Trust garners respect, understanding, and collaboration. After the objective of justice is obtained we will need to start healing a community and nation through the confidence built in trusting one another. 3. Relations. The ultimate result of the healing process will be shown in improved relationships, especially in moments of conflict or tension. I know this has been an ongoing process for as long as we’ve had people interacting with each other. So, what makes me think this is a solvable problem? It’s not so much that we strive towards a cleansing of all stereotypes, counterproductive beliefs, or tensions. Instead, we need to focus on responding more effectively to this sometimes-inevitable tension around differences. As we coach teams and individuals on “making workplace tension productive”, meeting people where they are and understanding how you show up in the conflict are key components towards getting better outcomes. Either party humbling themselves to value the other person’s perspective can often diffuse conflicts. Understanding one’s beliefs and assumptions, and challenging the ones that can result in a counterproductive outcome is critical to simply knowing self. And ultimately, if we’re able to get to a point of conversation, let’s hear each other with that willingness to be influenced by the “other side”. Imagine if George Zimmerman challenged his past perspectives and simply asked Trayvon Martin if he could be of assistance. I would hope any of my neighbors behind our Florida resident gates would afford my children or me the same level cultural humility. Unfortunately, we cannot turn back the clock and resurrect Trayvon with a school recess “do over”. We can, however, avoid turning back the clock on our relations across differences. We can choose, even in the midst of tension, to “show up as a grown up” (thanks Dr. Robin for that phrase). If our small towns are now progressive enough to charge the electric cars of the future, let’s work productively to build that future with compassion and trust. Darrell Butler is President of Butler Consulting Group — BC Innovations, specializing in productive work environments through diversity/inclusion, work-life balance, and personal empowerment. Please send inquiries to infobci@bg-inc.com.